The motor and battery carriers are mounted to a Blue Sky cycle cart. The 24 volt 300 watt scooter motors are controlled by 1505 Curtis controllers. The gearing is designed for 15 mph max speed. 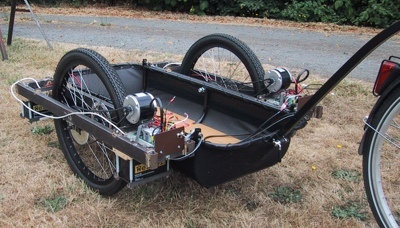 I intend to build a bike frame mounted hitch to lower the attach point and built a sensor that will automatically cut power and apply the disc brakes when the trailer pushes the bike. 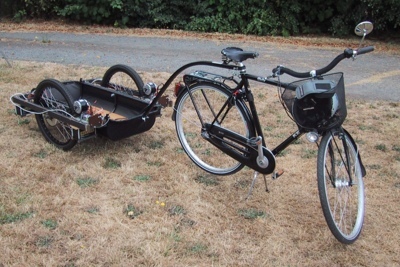 If the bike pulls on the trailer the controll will engage the motors. I hope to have the trailer behave "neutrally". Hopefully, I will be able to attach solar panels for some self charging, but I am already considering a more compact and lighter design. Mark Murphy of Blue Sky Design http://blueskydsn.com/ has been of great assistance with knowledge, parts, sources and encouragement.